Why Plan? All concrete placement and finishing operations should be carefully planned. Skill, knowledge and experience are required to deal with a variety of concrete mixtures and field conditions. Having the proper manpower and equipment available, and timing the operations properly for existing conditions, is critical. Thickness: A minimum of four inches is generally enough for a residential driveway or garage floor that will be used by cars only. If a parking area will be used by both cars and light trucks, the slab should be six inches thick. Frequent use by heavy trucks may require a slab six-to-eight inches deep. Base: Uniformly firm, sound subsoil is essential as a base for exterior concrete. Drainage: The surface of the finished job should slope at least 1/8 inch per foot. A slope of 1/4 inch per foot is best. Grass slopes adjoining concrete surfaces should have a minimum 1/2 inch drop per foot to ensure proper drainage. Think Safety: Special precautions are necessary when working with concrete, mortars or cement. Prolonged contact between fresh, wet cement-based products can cause skin irritation and burns. Be sure to take proper safety precautions after reading our section on Working Safely with Concrete. Excavating: Be sure to take out all organic matter such as tree roots, leaves, and wood. Don’t dig deeper than you need to. Compaction: Subsoil on which concrete is to be placed must be compacted uniformly and evenly so the slab won’t settle or vary in thickness. Forms: Stake formwork securely and plan for the finished slope that is required. Scrape the subbase away from the forms so that the edges of the slab will be full depth. If you need concrete forms to complete your project, these may be rented or purchased from Kuhlman. Isolation Joints: Before the concrete is delivered, install pre-molded joint material available from Kuhlman wherever flatwork meets buildings, steps, walls, existing slabs, or other fixed objects to avoid bonding to the structure. Joint material must extend all the way to the bottom of the slab. Reinforcement: Wire mesh or steel reinforcing rods are generally not required in exterior flatwork if proper jointing procedures will be followed later. Consider fiber-reinforced concrete as an alternative. Moistening the Subgrade: Shortly before placing the concrete, wet the forms and the subgrade. Don’t make the subgrade so wet that it’s muddy. Don’t spread a plastic vapor barrier under an exterior slab—this will force extra water in the concrete to escape through the top and will weaken the slab’s surface. Never place concrete on a frozen or muddy subgrade. Timing: Delays after the concrete arrives create problems in finishing and can reduce final quality. Complete the excavation, compaction, forming and other preliminary steps ahead of time. Strength: A successful job depends on selecting the correct concrete mixture for the project. The proper quality concrete mix should always be specified and used. Kuhlman can help you with this. Slump: The slump of exterior residential concrete slabs should be four inches, plus-or-minus one inch. The slump should not exceed five inches for durable concrete. Anything more than six inches is too wet to use unless a water-reducing admixture has been added. A slump greater than four inches will prolong the time you must wait before finishing, particularly in cool weather. Air Entrainment: The total amount of entrained air should be five to seven percent for exterior concrete in areas where freeze/thaw conditions exist. Addition of Water: Water should not be added by the contractor at the jobsite. Adding water dilutes the mixture to less than its designed strength and impacts the air content. If it is absolutely necessary to add water, put it all in at once and then run the mixer at full speed for two full minutes. Be sure to record the amount of water added. Filling the Forms: Chute, wheelbarrow or shovel concrete directly to its final position. Don’t dump it in piles and then flow, drag or rake it the rest of the way. Start at the far end and work to the near end. On a slope, use stiffer concrete and work up the slope. Spread the concrete using a short-handled, square-ended shovel, a concrete rake, or a come-along. Do not use a garden rake since it will cause segregation. Tamp the concrete with a spade or 2×4 along the edges of the form to release air voids and consolidate the concrete. All concrete should be placed within 60 minutes from the time the mixer truck was loaded. Shorten this time in hot weather. Protect any placed concrete from the hot sun, high winds or freezing temperatures. Leveling: Use a lumber or metal straightedge (called a screed) to strike off the concrete and level it. Rest the screed on edge on the top of the forms, tilt it forward and draw it across the concrete with a sawing motion. Keep a little concrete in front of the screed to fill in any low spots. Screed the concrete twice. Floating: Float the concrete as soon as it has been screeded. A float is a wood or metal tool used to further level the concrete surface and to embed the large aggregate. On small jobs a float is hand-held; on larger jobs a long-handled bull float may be used. One or two passes should be enough to smooth and level the surface without sealing the concrete. Floating must end before visible bleed water (water sheen) rises to the surface. Why Finish? Finishing is the operation of creating a concrete surface of a desired texture and hardness. Finishing makes concrete attractive and serviceable. The finish can be strictly functional or decorative as well. The final texture, hardness and joint pattern depends on the concrete’s end use. Exterior slabs should provide a texture which will not be slippery when wet. When to Finish: Wait for the concrete to stop bleeding. Bleeding occurs as the solids in the concrete settle. All other finishing operations must wait until the concrete has stopped bleeding and the water sheen has left the surface. Any finishing operations done while the concrete is bleeding may result in serious surface problems later. The waiting period depends on the weather and the mix design of the concrete. Immediately after all the bleed water is gone is the proper time to: (1) broom or float the surface once; (2) if hand tooled, cut control joints while the concrete is still in a plastic state, and (3) edge. Edge the concrete all the way around. Spade the concrete next to the form gently with a small mason’s trowel and use the edging tool to give the concrete rounded edges. Final Finish: Trowel the concrete according to its final use. A broom finish is recommended, particularly on driveways and sidewalks, as this is the safest and most durable finish. Where a smooth finish is desired, such as on a garage floor, a wood hand float finish should be used. Machine floating and/or troweling is not recommended. Caution: Do not overwork or overfinish the surface of any exposed concrete slab. Not only is it time consuming, but it also tends to bring too much fine material to the surface and weaken it. Never use a steel trowel on concrete exposed to the weather. Never sprinkle water or cement on concrete while finishing it. Joints: Control joints may be hand tooled or sawed; sawing is recommended. In either method, joints must be cut to a minimum depth of one inch or 1/4 the thickness of the slab and spaced no less than ten feet in either direction. Use a center-line control joint when driveways are more than ten feet wide. Joints must be straight and continuous; not staggered or offset. Concrete sections should be as square as possible. When control joints are sawed, this should be done after all other finishing and curing operations are complete and as soon as the concrete has hardened sufficiently to permit sawing without raveling. Control joints do not require sealing. When to Cure: Apply a curing treatment as soon after brooming and edging as possible. The concrete contractor is responsible for curing and protection of finished concrete. Need for Curing: Curing is one of the most important steps in concrete construction, and regrettably one of the most neglected. Effective curing is absolutely essential for strength and resistance to freezing, thawing and deicing salts. Fresh concrete must be kept warm and moist until the mixing water combines chemically with the cement. This is called “hydration” and is what hardens the concrete and gives it its strength. With curing, 6-bag concrete should reach 4,000 psi in 28 days at normal temperatures. Without curing, the same batch of concrete might never reach more than 2,000 psi. Low-strength exposed concrete does not perform well when subject to frequent freezing and thawing. Curing in Warm Weather: Curing can be accomplished in a number of ways, but the simplest, most economical and widely used method is a liquid membrane “cure-and-seal” which is sprayed or rolled on the surface of a slab as soon as practical after finishing. This must be applied at a rate not thinner than the manufacturer’s instructions. Your Kuhlman sales representative can suggest a curing compound which will meet the requirements of your project. Curing in Cold Weather: It is absolutely essential that fresh concrete be kept from freezing for at least the first week after it is placed. Curing blankets designed for this purpose can be very effective. 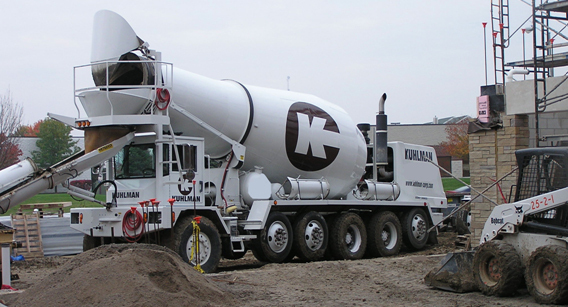 Kuhlman has a full range of products to help with cold-weather concreting projects. Drying: Newly placed outdoor concrete not only needs time to cure, but it also needs time to dry in warm air. Concrete placed early enough in the season so that it has one month of temperature above 40 degrees Fahrenheit for curing and still another month for drying out before hard freezes are expected (certainly before deicers are applied) has a decided advantage over concrete that has not dried out when cold weather begins. First Week: Owners and tradesmen should be advised not to drive on new concrete for at least seven days. During the First Winter: Owners should not use salt during the first winter, especially if the concrete was placed after September 15th and not sealed. Use sand instead. Don’t allow snow and ice to accumulate on the slab during the first year. Safe Use of Deicers: After the first winter, deicers containing salt and/or calcium chloride should generally be safe for use on quality concrete pavement. Never use a deicer that contains ammonium sulphate or ammonium nitrate. Sealers: Water repellent coatings and sealers can help prevent damage from freeze/thaw cycles and the intrusion of deicing salts. They keep water from getting into the surface pores. Just as we regularly paint homes and buildings, we should seal concrete routinely to protect it from moisture and prolong its life. Your Kuhlman sales representative can suggest a concrete sealer which will meet the requirements of your project. Proper Drainage: Do not allow drain water to undermine the concrete slab and cause settlement cracks. Practicing proper placement and finishing techniques will result in durable concrete that will last a lifetime.